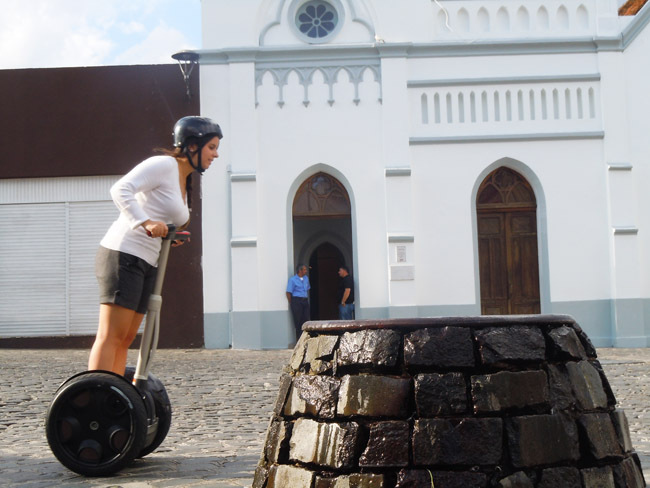 SEGWAY CURITIBA: Experience Curitiba in an innovative and fun way! Segway is an innovative self-balancing personal and electrical transportation device, perfect to be used on pedestrian sidewalks and pathways. It was created in 2001 in the United States and it is the first self-balancing and zero emissions personal transportation vehicle. Yes, it doesn’t have any accelerator or brakes! The acceleration responds to the conductor’s movements and inclinations, simply leaning forward or backwards, very easy and safe to use/ride. Segway can reach speeds of 20 km/h (12 mph) and can only be used by people older than 12 years old that weights between 45 kg (100 lbs) and 118 kg (260 lbs). The tourism industry have discovered its potential and Segway Tours have been launched in several main travel destinations around the World. They are very exciting, fun, safe and give you the opportunity to experience the destination in a new way! Considering this, Special Paraná (whl.travel‘s local connection in Curitiba and Paraná Coast)launched few weeks ago SEGWAY TOURS CURITIBA, the first Segway Tour in Brazil with daily departures! It is very very easy to ride a Segway! Even though, the tour guides will give you a short training and orientation session before the tour for about 20 minutes, so you can try and practice until you feel yourself confident and ready to glide through Curitiba riding your Segway. It is so easy that I guarantee that you will be ready within 5 minutes!!! After that, the guide will lead you on the tours where you will get to see Curitiba in a different perspective! The groups are small (5 people) and fun is guaranteed either on sunny or rainy days, during the day or at night! This is the main and most popular tour. Taking the Central Basic Segway Tour you get to see several interesting places in downtown and main tourist attractions of the historical center of Curitiba like: Tiradentes Square, Cathedral, Saint Francis Ruins, Belvedere, Largo da Ordem (Old Town), Paço da Liberdade (former city hall), Generoso Marques Square, Palácio Avenida, Rua das Flores (pedestrian street), Boca Maldita, Rui Barbosa Square, Zacarias Square and Osório Square. For bookings and further details, click here. This is an excellent tour option for you that want to enjoy and ride Segway for more time and also get to see other famous tourist places in Curitiba, the wonderful Oscar Niemeyer Museum and the relaxing Pope Woods. In this route, you will ride your Segway on bicycle paths most of the time and see the following points of interest: Tiradentes Square, Cathedral, Osório Square, Rui Barbosa Square, Rua das Flores (pedestrian street), Santos Andrade Square, Federal University of Paraná, Guaíra Theatre, Passeio Público, cycle path, Pope Woods and Oscar Niemeyer Museum. In this tour you will pass by most tourist attractions in Curitiba downtown and historical centre, like: Tiradentes Square, Cathedral, Saint Francis Ruins, Belvedere, Largo da Ordem (Old Town), Paço da Liberdade (former city hall), Generoso Marques Square, Palácio Avenida, Rua das Flores (pedestrian street), Boca Maldita, Rui Barbosa Square, Zacarias Square, Osório Square, Santos Andrade Square, Federal University of Paraná, Guaíra Theatre, Passeio Público, Praça 19 de Dezembro Square, Riachuelo Street and Solar do Barão. This is an alternative route for when it is not possible to pass by the historical centre of Curitiba in reason of the events and cultural celebrations that take place in the local. The attractions visited in this tour are: Passeio Público, Rua Riachuelo, Santos Andrade Square, Guaíra Theatre, Federal University of Paraná, Rua Barão do Rio Branco, Eufrásio Corrêa Square, Train and Railway Museum, Carlos Gomes Square, Rua das Flores (pedestrian street), Osório Square, Rui Barbosa Square, Tiradentes Square, Generoso Marques Square and Paço da Liberdade (former city hall). Tours departure from Crowne Plaza Curitiba Hotel. The hotel is located on Rua Presidente Carlos Cavalcanti, 600 – downtown, really close to Passeio Público and Largo da Ordem, the historical center. Come to experience this new tour that Special Paraná exclusively brought to Brazil! 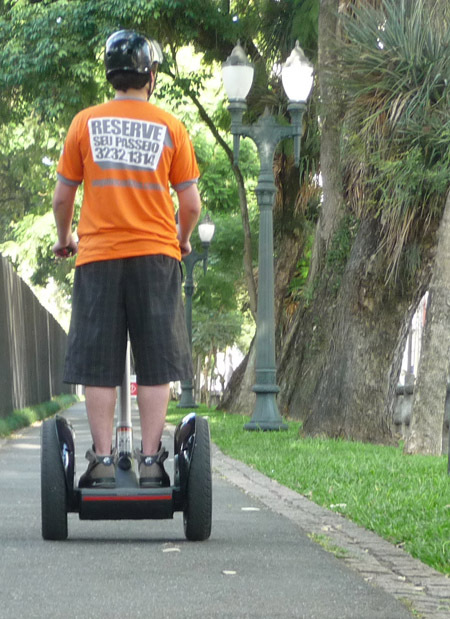 Book your Segway Tour Curitiba now and get to know and experience Curitiba in a different way! Curitiba is considered the Brazilian capital of Christmas and the city really gets excited andvery very pretty with all the lights and Christmas decoration. Another amazing thing that happen in Curitiba at the end of the year to celebrate this beautiful date is the famous HSBC Christmas Choral that starts TONIGHT!!! The HSBC Christmas Choral is a breathtaking and sweet event that sends a message of peace and hope. The HSBC Christmas Choral is one of the most traditional and exciting Christmas celebrations in Curitiba and also in Brazil. The chorale formed by more than 160 children, presents Christmas songs in the windows of the historical HSBC building, the famous Palácio Avenida. The historic building Palácio Avenida located at Calçadão da XV or Rua das Flores is all decorated with a fantastic illumination. Fireworks complete and give even more magic and charm to this fantastic event that happens in Curitiba every year. The Palácio Avenida becomes a real Christmas card! 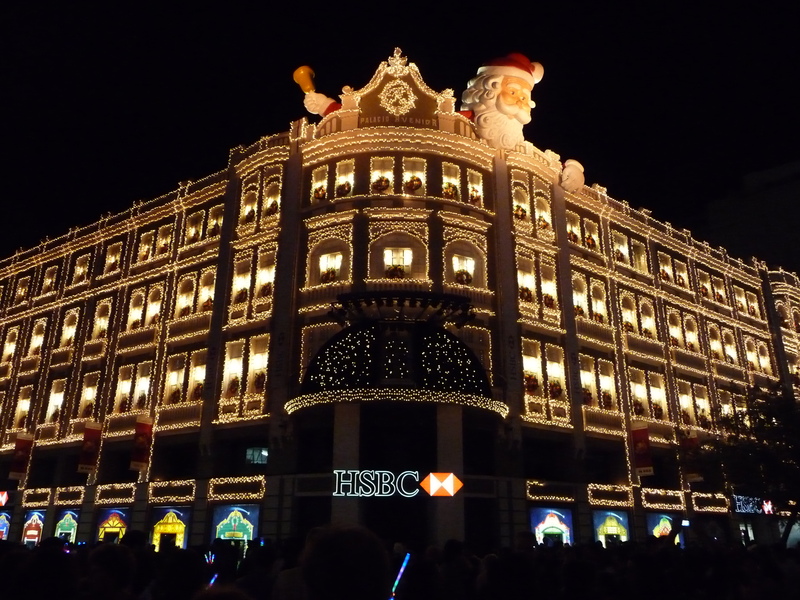 This year, the HSBC Christmas Choral completes 20 years and 200.000 people are expected to watch the spetacle. November: 25th, 26th, 27th and 28th at 20h30. December: 3rd, 4th, 5th, 10th, 11th, 12th, 17th, 18th and 19th at 20h30. If you are visiting Curitiba during Christmas, watching the choir is a must-do! Watch the video: Enjoy Curitiba | Curta Curitiba | Aproveche Curitiba! We found a really interesting and cool video about Curitiba made by the Curitiba City Hall and we would like to share the video with you here! The video is available in 3 different language: English, Portuguese and Spanish. Watch it, enjoy Curitiba and find out what one of the best cities to live in the World has to offer you and how you can enjoy Curitiba! We hope that you enjoyed watching the video and we would love to hear your coments and feedback about the video. 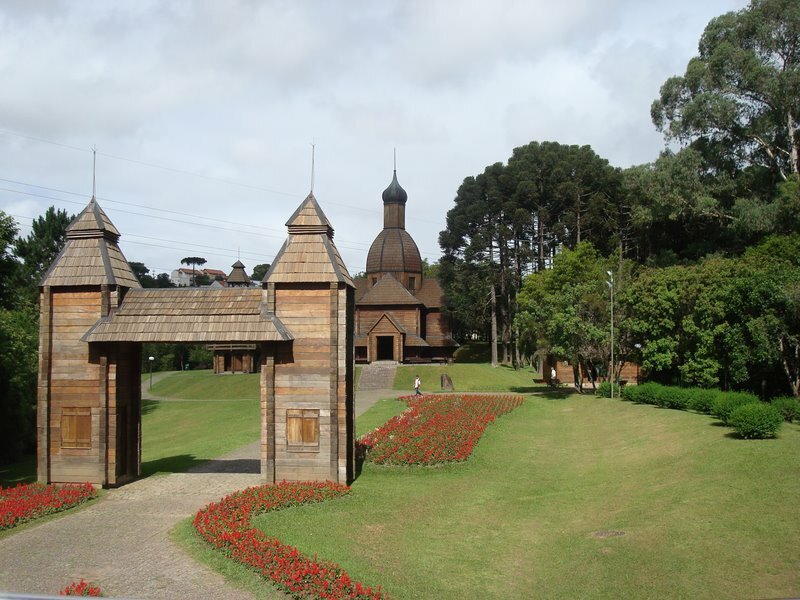 FIFA 2014 World Cup Brazil: 14 Good Reasons to Visit Curitiba during the World Cup! Now that the 2010 FIFA World Cup South Africa is pver, the World is already looking forward to the next one, the FIFA 2014 World Cup Brazil. If Curitiba is considered the best city to live in Brazil, what about to visit? What to do? What to expect? 1) Host City for 1950 and 2014 FIFA World Cup Brazil. 2) World’s Most Sustainable City (Globe Award 2010 – Sweden). 3) Sustainable Transport Award 2010 (ITDF – USA). 4) Over 50 m² of green area per inhabitant, with 32 parks and woods. 5) The cleanest city in South America. 6) Brazil’s largest ethnic diversity. 7) Best cultural destiny in Southern Brazil (Veja Magazine). 8) 4th best brazilian city for tourism (Trip and Tourism Magazine). 10) Over 150 hotels, 10.000 apartaments and 18.000 beds. 11) Various gastronomy options with influence of numerous ethnies. 12) Great shopping: more than 30 malls and street markets. 13) Home of Atlético Paranaense, Coritiba and Paraná, soccer teams with 6 national championship titles. 14) Located less than 100 km of the shore, with historical cities, islands, beaches and bays. We would love to hear your comments! Feel free to share and leave a comment about other reasons to visit Curitiba.